OTTAWA, Canada -- Canada is moving ahead with the destruction of surplus anti-tank missiles and other equipment worth hundreds of millions of dollars despite a plea by Ukraine for such equipment to help it fight separatists. Canada's Department of National Defence said it tried to sell some surplus Buffalo (L), and Husky vehicles, but could not find any buyers. Among the items declared surplus are more than 5,400 Eryx anti-tank missiles, according to a 2014 Department of National Defence documents leaked to the Citizen. In addition, there are 10 Husky and Buffalo vehicles, used to clear routes of improvised explosive devices. Those vehicles were purchased in 2007 for use in Afghanistan. 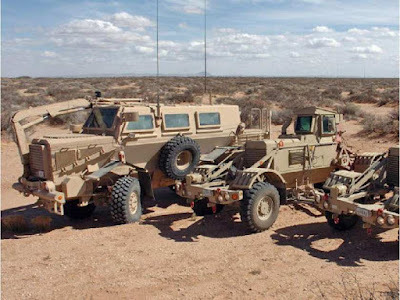 Also surplus are four specialized landmine detection systems and 194 LAV-2 or Light Armoured Vehicles- 2 surveillance vehicles scheduled to be taken out of service this year, according to the documents. Liberal defence critic Joyce Murray said the stockpiles raise questions about Defence Minister Jason Kenney’s earlier claims that Ukraine’s beleaguered army can’t be provided with useful Canadian equipment because no such gear exists. Ukrainian officials came to Ottawa in September looking for anti-tank missiles, surveillance gear and armoured vehicles. They say their forces are outgunned by separatists equipped with Russian tanks and other weapons. But Kenney recently told the Globe and Mail newspaper that Canada has nothing to offer. He ordered an inventory of weapons be done earlier this year and that determined the Canadian Forces did not have useful surplus equipment that could be shipped to Ukraine. Ukraine’s soldiers use Russian-designed weapons so armaments sent from Canada could not be used, he added. Canadian military officers say that is the case for small arms and other such weapons. But Canadian anti-tank missiles could be used, surplus armoured vehicles could provide protection for troops, and the Husky and Buffalo vehicles would be valuable in dealing with roadside bombs, military sources noted. Asked specifically about the missiles and other equipment, Kenney’s spokeswoman Lauren Armstrong stated that the minister had already made his comments about the issue. She referred questions to the Department of National Defence. The Department of National Defence in an email acknowledged the stockpiles of surplus equipment existed. But spokesman Dan Le Bouthillier pointed out Friday that in some cases the equipment would either require too much training for the Ukrainians to use or would have to be refurbished for combat operations. In other cases the vehicles are equipped with machine-guns that use NATO ammunition not in Ukraine’s stockpiles. Canada tried to sell the stockpile of 5,400 Eryx anti-tank missiles but couldn’t find any buyers. So the missiles are now being destroyed, according to DND. The launchers and other related gear are also being destroyed. “The small number of systems involved would not justify creating the maintenance (spare parts and tools) infrastructure Ukraine would need to operate them,” Le Bouthillier stated. DND also tried to sell some of the Husky and Buffalo vehicles but with no success. Those vehicles, part of a $30- million deal in 2007, will now be destroyed. Some of the LAV-2s will be sold or destroyed while a disposal strategy for the rest still has to be worked out, according to DND. The DND hasn’t figured out what to do with the landmine detection systems. Liberal defence critic Joyce Murray said she is not surprised there is usable surplus equipment available despite what Kenney claimed. “The minister is saying one thing and we’re finding the opposite is true,” she said. Anti-tank missiles “could give Ukrainian troops a credible capability against separatist and Russian heavy armour,” the private intelligence firm, with close links to the U.S. defence establishment, pointed out. Other needed equipment included armoured transport vehicles and battlefield surveillance gear, Stratfor added. Canada also has 415 thermal imagers from the Eryx anti-tank weapons, according to the documents. Such devices can detect the heat given off by armoured vehicles and can be used for surveillance. Canada is a key supporter of Ukraine and has denounced Russian involvement in the ongoing crisis in the region. Included is non-lethal equipment such as helmets, bulletproof vests and night-vision goggles. But in August 2014 Vadym Prystaiko, then Ukraine’s Ambassador to Canada, told the Citizen that his country needed Canada and its allies to act immediately by providing “real” military support. Prystaiko noted Ukraine’s wish list included fighter jets, surveillance equipment and light armoured vehicles. Ukraine troops have also faced improvised explosive devices such as those Canadian soldiers dealt with in Afghanistan with their Husky and Buffalo vehicles. DND also had around 2,000 TOW 2 missiles, worth $100 million, as part of its surplus stocks, according to the documents. Those missiles, purchased in 2009, have been disposed of but DND could not provide details about whether they were destroyed or sold. The Canadian Army decided to get rid of the missiles as it tried to deal with cost-cutting measures brought in by the Conservative government.